A line of user-customizable vacuum pump inlet and exhaust traps for small manufacturers, labs, and universities using diaphragm pumps, dry piston, and dry scroll pumps is available from MV Products of No. Billerica, Massachusetts. MV PosiTrap® Vacuum Inlet Traps are offered in straight-through and right-angle designs with a wide selection of filter cartridges to protect vacuum pump fluid from being contaminated and prevent oil back-streaming. Ideally suited for small manufacturing facilities, labs, and universities, they can filter volatile organics, acids, and particulate water vapor. 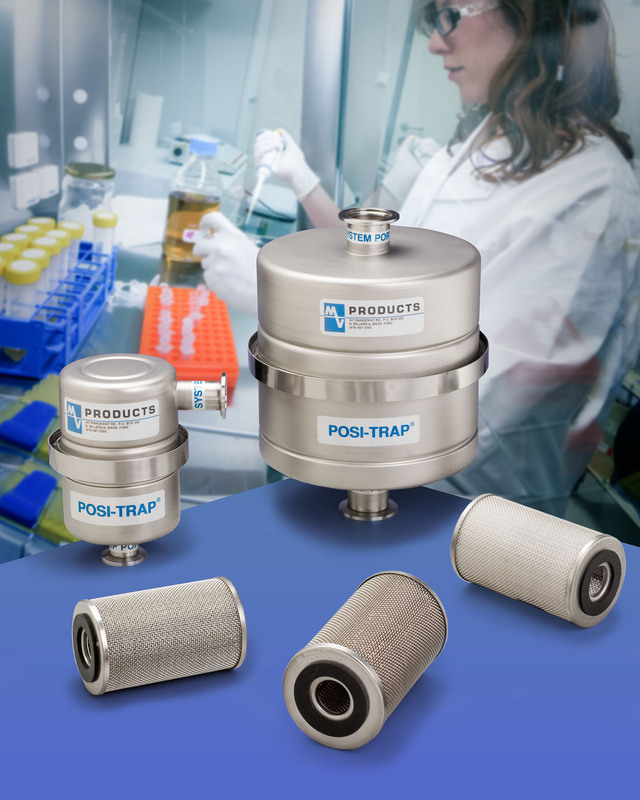 Featuring a wide selection of filter elements including specialized media such as polypropylene filters with 0.2 micron pore size, MV PosiTrap® Vacuum Inlet Traps are positively sealed at both ends. The traps are made of stainless steel and come in 4” and 8” dia. sizes for pumps up to 25 and 50 CFM, respectively. Larger production sizes are also offered. MV PosiTrap® Vacuum Inlet Traps are priced from $275.00 (list), depending upon the selected filter cartridges.